I was flicking through Sky Movies this afternoon and decided to watch ‘Deep Rising’. I hit the ‘i’ button on the remote before the film began and learnt that it was about a bunch of pirates who attempt to rob a cruise ship, unfortunately “something had already got there first”. After watching the first fifteen minutes of the movie I assumed that the something was actually a “someone” and that stealthy sleek jewel thief Famke Janssen was the person who would outsmart the pirates. What I didn’t expect was a flesh eating multi-tentacled sea creature to turn up and kill everything in sight. It was not until the cruise liner comes to a crashing halt and an Asian woman is killed in a toilet cubicle that I realized – hang on a minute, there’s something strange going on here. This is a monster movie. Disappointingly it all goes downhill from there. The survivors battle against the odds, as one by one they get picked off by the monster in gruesome fashion. You’ve seen this movie before, either with an alien, a serial killer or a supernatural beast. It’s that formulaic. Our heroes and heroines discover something horrible, panic about the discovery, run away for a while, and then eventually escape. Famke Janssen was my teenage movie crush in the nineties, and she’s the leading lady in this film, playing the sneaky Trillian St. James. 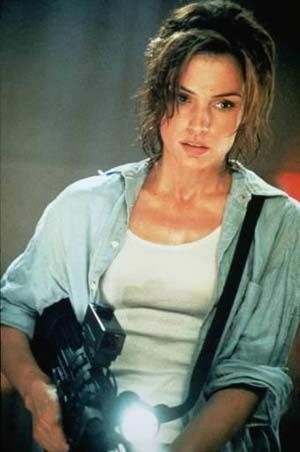 I think my attraction to Janssen may have had something to do with her crushing Russians in her well-toned thighs in ‘Goldeneye’ or as an authoritative teacher in teen sci-fi horror ‘The Faculty’. Given that I’m regressing back to my horny teenage lusting period it makes sense to say something that I probably would’ve said back in the late nineties – Janssen smokes up the screen with her hotness. For a while she wears a tight fitting red dress, when the monster is raising hell she changes into something casual and ultimately more practical attire for fleeing from a blood thirsty sea monster. 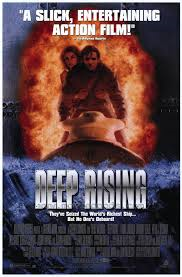 ‘Deep Rising’ could’ve been dramatically different had the hero role of John Finnegan gone to Harrison Ford, instead Treat Williams got the gig and he does ok. Though I can’t help but wonder if he’s trying a little hard to be Jack Burton from ‘Big Trouble…’ (replace truck driver for hire with boat captain for hire), kinda bumbling along confidently despite having no idea what he’s going up against. For one thing he and his crew agree to ferry a group of heavily armed pirates and their torpedoes out on an ocean trip, destination unknown. Finnegan’s pretty dumb not to be at least a little curious about his passengers. The multi-tentacled sea monster is able to do things that I’ve never ever seen a sea monster do on screen before, somehow it is able to stretch itself miles through pipes and corridors; its tentacles splitting off into several nimble angry fanged openings, hungry for anything with a pulse. The monster feeds on the ship’s crew and passengers, and then the invading pirates, leaving skeletons in the bowels of the boat. Despite seemingly being powerful enough to stop a ship in its tracks, and smash through iron, and even clever enough to sneak up on its victims, it has real difficulty catching the final few survivors, consistently getting outsmarted by them. ‘Deep Rising’ cost forty five million dollars to make, and made just over eleven million at the box office. 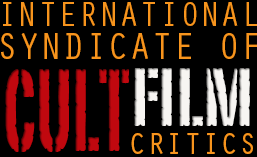 It was a stone cold flop, and can be best described as a damp squid of a movie.